Easy Garlic Ginger Glazed Sticky Pork is one of my most popular recipes here on Foodie with Family. Read on to see why! It’s no secret that food is my forever friend. It’s pretty easy to get me to hold forth on the subject in general, obviously. All that being said, I am especially passionate about the sub-category of food made of simple recipes using basic ingredients that deliver major flavours with minimal effort. Easy Garlic Ginger Glazed Sticky Pork is all of those things. I want to clarify for a minute. There are two schools of thought on describing a food as ‘easy’. Some folks think it’s gauche because using it perpetuates the false notion that somehow good food has to be complicated. I get it, I really do. At the same time, I think that reminding people that a dish is “easy” is a kindness and a comfort. It’s like having a favourite pair of jeans that you put on when you need to have a good day. The word “easy” is a reassuring one. It tells you you won’t be chained to the counter for hours upon hours or employing complex techniques that are more suited to angry French chefs who are prone to throwing pots. For that reason, I’m unapologetic about calling recipes ‘Easy”. Easy, easy, easy, easy, E-A-S-Y. 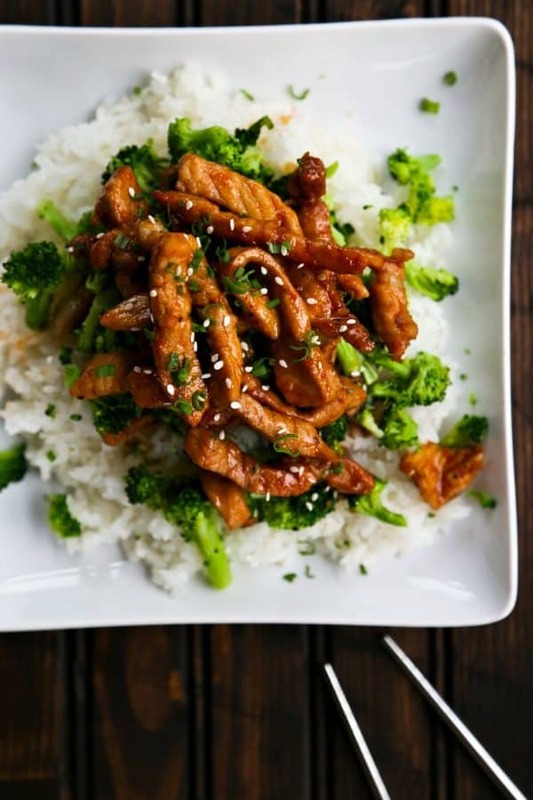 Easy Garlic Ginger Glazed Pork is a perfect example of what I mean. If I called it sweet and spicy lacquered pork, I’d technically be correct, but I’d also be intimidating the heck out of starter cooks. And the truth of the matter is that Easy Garlic Ginger Glazed Pork is nuanced enough to keep a sophisticated eater and cook happy, but simple enough that even the most rookie cook can make it happen for a fast dinner. THAT is my happy place. 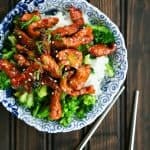 Tender strips of pork glazed with a sticky, sweet, spicy, garlicky, gingery sauce that is as easy as stirring a few things together in a pan, it’s hard to beat this for a fast, soul-satisfying meal. As with many stir-fries -and this could be considered one- Easy Garlic Ginger Glazed Sticky Pork relies on the cook having everything prepared and set out before any flame or heat source comes anywhere near the pan. The bulk of the work comes before you ever put one molecule of anything in the pan. The goal with cooking the pork is to take it to being 2/3 done. This means that if you cut one strip of pork in half, you’ll be able to see the outer layer is lightly browned, the next 1/3 of it will be pink but opaque and the center should be slightly shimmery and darker pink. It will continue cooking when the sauce comes into play. If you take the pork too far at this point, it’ll be overdone when the sticky, flavourful glaze is lacquering itself to the pork. See what I did there? I worked in those fancy-pants culinary terms to placate my purists. Who loves you? I do. This is the same motivation behind moving the pork to a plate and starting the sauce by itself. Sometimes it behaves a little oddly, and until it reaches a certain point (slightly thickened, bubbly, and smelling slightly caramelized), you don’t want to add the pork. The pork strips will finish cooking in the sauce, but it’s easier to add a splash of liquid to keep it cooking longer than it is to make the sauce magically evaporate to doneness because your pork is done. Trust me. If there was a way to abracadabra the sauce to doneness, I’d be all over it. 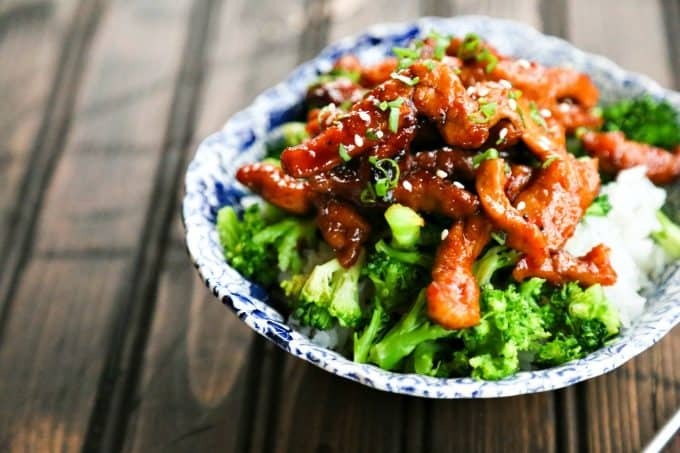 You can serve Easy Garlic Ginger Glazed Sticky Pork any which way you wish; over rice, with green vegetables, on noodles, or with toothpicks as finger foods. My personal preference is with steamed or Spicy Asian Roasted Broccoli over rice. 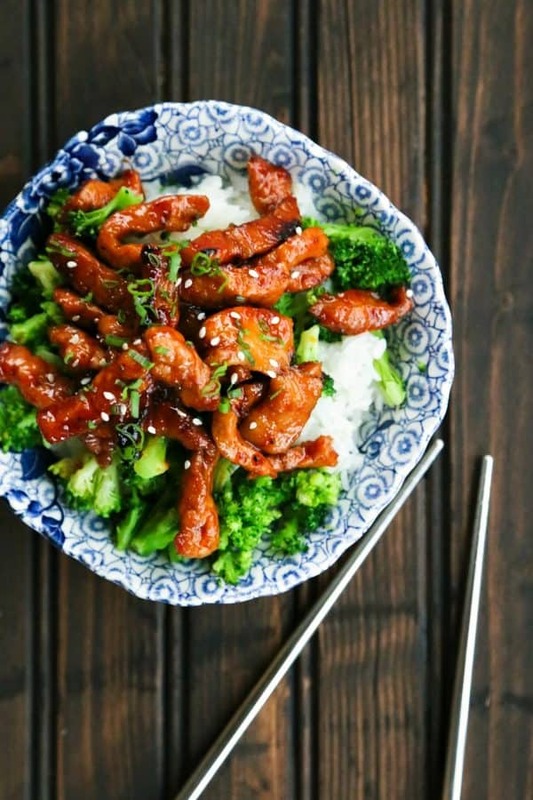 Tender strips of pork glazed with a sticky, sweet, spicy, garlicky, gingery sauce that is as easy as stirring a few things together in a pan, this fast, soul-satisfying meal is easy enough for rookie cooks, but delicious enough to keep sophisticated cooks and eaters happy. Pour the oil into a heavy-bottomed skillet over medium high heat and swirl to coat. Let it heat until it is shimmering. While the oil heats, sprinkle the pork strips with kosher salt and black pepper then toss with your hands to distribute it evenly. Carefully add the pork to the pan, working in batches to avoid overcrowding the pan. Let the first side brown, flip the pieces with tongs or a spatula, and brown the second side. Transfer the pork to a plate. Return the pan to the heat and add in the garlic and ginger. Stir until fragrant, about 30 seconds. Raise the heat to high and pour in the sauce mixture and bring to a boil, stirring frequently. When the sauce is very bubbly and thickened like warm honey, toss the pork back in and toss constantly to coat everything and reduce the sauce to a thick, sticky glaze on the pork. This can be served immediately over rice, noodles, or as finger food, or can be allowed to cool and be eaten cold. This post was originally published July 22, 2015. Updated April 2017 with video and improved Cook’s Notes. ohmygoodness, yes. So much YES to this. HIGH FIVE!!!! This is my dinner wheelhouse! I haven’t completed reading the whole blog and I’m already in…..Yum…. Hands down you are my best source for “easy” delicious Asian influenced dishes. I really want this for dinner tomorrow night, Would chicken thighs work reasonably well here? We have had enough pork in the last week that the natives have become restless, but I hate to wait for this one. I would say chicken thighs would be delicious, but you’re going to have a little different result, obviously. You’ll want to adjust the cooking times, as the thighs are more juicy, as a rule, too! Yum! This looks amazing. Pinned for later! This is a good recipe, and the explaination about reducing the sauce before you add the pork is key, very good for including it. This was nothing short of fabulous. Every member of my household LOVED it! Thanks for another winner! Easy and delicious recipes are definitely the best. I love good food, but I don’t have a ton of time and energy. Easy is best! This recipe looks great. I wish I hadn’t just ordered a pizza because this sounds incredible! Oh my goodness. What a sweet thing to say. Just made this recipe and it was DELICIOUS. So simple and quick to make. My hubby also gave it 2 thumbs up. Will be making again for sure! Making this now! Can’t wait. Trying to decide what to eat with it. This recipe has traveled far and wide. I am making it tonight in South Africa. So glad that I had all of the ingredients at hand. No shopping list required. 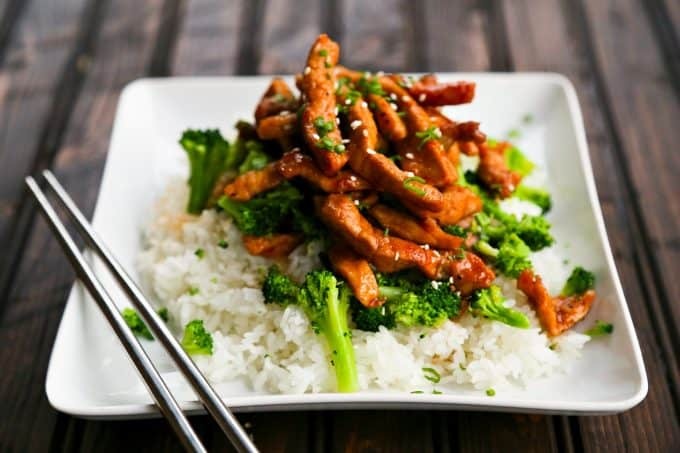 I am having it with rice and broccoli as image shows. Looks delisb. Hope hubby will enjoy this something from nothing asian inspired dish. Thank you for posting. Could you please tell me would this work if I chucked it all in a slow cooker? Wanting to make it tomorrow do you think it will be ok? Hi PIP- I’m afraid I don’t think it would work out really well to do that. It definitely wouldn’t form the same sticky ginger glaze in the slow-cooker that it does in a pan on the stovetop. I thought it was delicious but it never got sticky and was much lighter in color than the picture. It was a little too spicy with using 1 TBSP of Sriracha sauce so I would cut back the next time. It is definitely a keeper. Thanks, Kari! If it was lighter and not sticky, it sounds like maybe your burner on your stove wasn’t throwing enough heat. Is it an electric stovetop? Sometimes that can do it! Glad I read the comments. I had the same problem with sauce not sticking and was using electric range. Used a little corn starch. The dish was delicious. Will be making it again. HI Rebbeca – this recipe looks fantastic! I have some left over pork tenderloin that grilled to medium…do you think I could use that to make this recipe, and if you think it would work can you suggest how to use the pork tenderloin so that it doesn’t get too dry while recooking? Thank you! Hi Annette- I think if you make the glaze and boil it to being super thick, you could slice the grilled pork and toss it in to coat! Of course, I haven’t tried this personally, so it’s just a guess. Let me know how it works if you try it! I did just this, used leftover roast pork loin sliced into strips. With about 1 Tbsp chili-garlic paste instead of sriracha (little kids that don’t do spicy yet), it was delicious over jasmine rice. I had the same issue as a previous commenter, lighter in colour sauce (could be due to not using a pile of sriracha) that did not reduce very well (gas stove, on medium-high heat) and perhaps I could have waited longer but we were hungry! I wonder if it’s the kind of honey used. Mine frothed a lot, but didn’t seem to reduce much over 10 minutes. Hi Emily- I’m so glad you liked it a lot! Frothing is the first step in the sauce reducing. I’ve edited the instructions of the recipe to clarify how to get it to reduce faster. If you bump the heat up to high, it should reduce far faster, you just have to watch it more carefully to prevent scorching. Thank you for your excellent feedback. Looks perfect for serving with some veggie fried rice tonight! Thanks! That’s the truth!!! Sounds delicious! This was so delicious! I used leftover roast pork loin, warmed it slightly in the skillet, and removed it to a plate. Then I proceeded as directed. It would be a hit with children without the hot pepper sauce. I will definitely try this again, maybe with chicken breast next time. Thanks for a great recipe. Hi Gail- I do not include calorie counts on my recipes as a rule. Both because I think serving sizes are unrealistic, and because I am uncomfortable calculating calories because of my tendency to over-control them when I do that. If you’d like to determine the calories for your own purposes, there are many free online calorie calculators available where you can plug in the recipe and get calorie counts. Best wishes! this looks amazing. I only have pork chops, do you think that would work? Hi Nicol- I’m sure the glaze would be delicious on pork chops. I can’t tell you how long it will take to cook the chops, but I’d say cook them how you like them, then glaze as directed! That is excellent to hear. Thank you! I think you’ll enjoy this, Dennis! We too lost our favorite Chinese restaurant due to retirement. This has the flavors we have been looking for. Thank you. You can never stop blogging or our family will starve! HA! You’re so kind. I’m very glad you like it and very sorry your favourite restaurant closed. This was awesome! Only I used the minimum sriracha sauce called for and it was super spicy hot! So, if you’re like me and like mildly hot foods I suggest you reduce the sriracha sauce even more than the 2 tablespoon minimum. I will make this again as it’s easy and delicious, but I will definitely reduce the sriracha sauce. Thank you for a great recipe. Looks delicious. I will be making this soon. What a waste of time. I couldn’t see the menu for ads. Never again! I’m sorry to see you go, Alastair, but those ads reimburse me for my significant investment in camera equipment and ingredients for recipe development, the cost of creating, hosting, and maintaining a recipe website that is free to anyone on the internet, and my time. My thought is that scrolling past those ads is do-able. That’s wonderful, Kelli! Thanks so much, and I’m so glad you liked it! This is, without a doubt, the worst thing I have ever made. Instead of eating this, I would recommend starting a corn syrup IV and snorting a line of cayenne. I would rather eat the pork raw and risk getting trichinosis than ever have this again. Gorgeous and fast! Two essential elements when pressed for time. Foodie with family is now bookmarked! Made this last night for my fiancé and it was definitely a win! He can’t wait for me to make it again and was jealous after I ate the hidden leftovers. I hear you, Lydia. 🙂 I had to go around and remove part of each of the servings my kids had helped themselves to in order to make sure they left enough for their older brother who was at work when I served dinner. Buncha vultures! 🙂 I had to hide those, too! Can you substitute chicken in this recipe? For sure! You’ll have to watch it and cook it a little less time, though! That sounds like it will be positively delicious! I made this last night. Two tab!espioons of Sarachi would have killed me I’m sure. Did half a tablespoon and it was plenty. I also added a quarter cup of orange juice to thin it out a bit because I wanted to add fresh spinach. Served with brown rice. Was delicious. I haven’t tried your recipe, but RESPECT! You put a lot of time, energy, love, and passion into your work and ask for nothing in return. Well, shoot, Sonia. You just made my day. Thank YOU for being so kind and generous with your praise. Have an awesome weekend and thanks for being here! I never leave comments. This was so good. I used too much sriracha but still… this will be in rotation for easy dinner. Maybe prep ahead even. Thanks for doing what you do! Hello there! I’m so glad you loved it so much! Prepping ahead cuts down the time even more! I can’t even cook and it still turned out to be delicious! The explanation about how to cook the pork really helped me to keep it tender and juicy. I used sweet chilli sauce instead of the one the recipe called for, because that’s what I had on hand. We loved it, but it is maybe a bit too sweet? Any ideas of what some of the honey could be substituted with? This recipe was so easy and the whole family loved it! I added sesame oil to the meat as I was cooking it. That’s a great addition! Thanks for letting me know you liked it and rating it so well! Wonderful meal, and so easy and delicious for leftover pork loin roast. Love it. Delicious and easy indeed! Thanks for the recipe. Such an easy and delicious recipe for a weeknight meal! My family love this! Thanks for such an awesome recipe! This pork is amazing! That sauce is to die for! I’m so glad you love it, Erin! This is going to be dinner tonight, with steamed broccoli and white rice. Can’t wait to cook and eat this dish! the flavors are so fantastic! It’s way better than take out and so easy to make. Thanks, Karla! We love it madly, too! This pork is fabulous on a wild rice! So much flavor! Thanks, Diane!! I’m so glad you like it. It’s a stand by for us. From 4 to 38 yrs old, we had 100% approval to this meal!!!! Thank you, Joelle! I’m so glad you all enjoyed it. That makes me so happy. Well it looked lovely in your images and was very easy, but despite following the recipe and instructions to the letter – the sauce reduces, but doesn’t thicken or get sticky – so the pork doesn’t coat the way the pictures show. Will try again – but can’t see how these ingredients will go to sticky without something, like Arrowroot or Cornflour added? Although it ‘tasted’ good – it was really the authentic, sticky finish that I was after. Hi Linda- I wonder if maybe your burner is a little less powerful than the one I cook with. Next time try reducing the sauce some more. Make sure the bubbles are stacking on top of each other and it smells caramely before you add the pork in and toss it to coat. The idea is to have it reduced well before tossing with the meat. I don’t use any arrowroot or cornstarch when I make it. This was so Good! It was a hit with the whole family! My son is already claiming the leftovers. Made this for my family and company tonight. My husband embarrassingly grunted through the entire meal. He would not stop talking about it and said “make sure you keep this recipe”. I served it with basmati m, topped with sesame seeds and scallions and a side of steamed broccoli. Our guest said it was the best Asian food he’s had in a long time. Definitely a keeper!! This is my first time ever comme ting on a recipe, but I HAD to. Absolutely amazing. Well, you just made my day, Mia! Thank you so much!!!! this was okay. I don’t like writing negative reviews, but I also rely on others reviews when choosing recipes, so this is a bit negative. I knew it was an “americanized” chinese dish just by the recipe, but it still looked like it might be good. The pork juices don’t seem to be taken into account,- when removing the pork should the juices be left. I removed them with the pork, but even before adding them in I tasted the honey, vinegar, garlic-chili mixture and wasn’t really impressed, nor did it get very thick.. I was glad to find a recipe that used the garlic-chili,( because I had some to use up- my Chinese friends never use it) but it really doesn’t hardly any heat. The sauce mixture had a real vinegar taste even though it was only 1TB with all that honey. I added some rock candy ( could have used sugar too) and since the liquid was so thin. I also added some chinese cabbage. The end result over rice was okay. The sauce could have been thickened with a bit of corn starch but I decided not to. Nothing I would bother making again though. I’d like to address some of the issues you ran into with the recipe, because from what you’re saying, I think I can extrapolate a couple of things that went wrong. First, I want to make clear that this is not an authentic Chinese recipe. It’s definitely inspired by Asian cuisine, but is in no way actually a Chinese recipe and I’m pretty sure I was clear on that. And I love certain Americanized Chinese or Chinese Inspired recipes. I don’t think it makes them less worthy of being made, it’s just different. Second, if you’re working in smaller batches with the pork, as specified in the recipe, there shouldn’t be much in the way of juices building up. If there are enough juices in the pan that you’re simmering the pork instead of browning it, you may have been overcrowding the pan. Next time, try fewer pieces of pork so the juices can evaporate. That said, if your pork has had a lot of brine added to it before purchase, it might throw more liquid in the pan. If this happens, it’s okay, it’ll be taken care of in the next couple of steps. The recipe says to transfer the pork to the plate. You can use tongs for this or slide the contents onto a plate. Again, it’s the all-important reduction of the sauce that will deal with this. Third, and most importantly, when you whisk together the honey, vinegar, and chili-garlic mixture, it’s not at its finished state and is most definitely going to taste vinegary and odd. Part of the alchemy of the recipe comes in the reduction of the sauce. The recipe does specify to let it boil over high heat until very bubbly and thickened. After that point, the pork is tossed back in and reduced even further into a thick glaze. If you had runny liquid, it was definitely not reduced enough. Having a major flame under it and letting the liquid evaporate will absolutely eliminate any need for cornstarch to thicken it. This is supposed to be sticky glaze, not a thickened sauce. It is going to require a little time and attention. I just made this for lunch using some leftover pork loin. Sauce is great and super easy! So good topped with toasted sesame seeds. Going to make it soon for family dinner using boneless drumstick meat I have in the freezer along with some Asian veggies. Thank you! Thanks so much, Michael! I love the idea of using boneless drumstick meat! Found the above recipe on a site for using cold leftover loin of pork – do you think it would work OK? Hi Ellie- I haven’t tried it, but quite a few commenters have and have enjoyed it. If you browse through the comments, you might find some insight into how they made it! Loved the simplicity of the dish but it was tooooo spicy and overpowered by sriracha. 1 tbsp max if I even cook this again. Super quick and easy and so so tasty. Perfect week night meal. Thanks so much, Cathy! I am so glad both that you love it and that you were kind enough to review it for me! The flavor is outstanding but the sauce was too thin. 🙁 Perhaps more honey? Yum!! I love making Chinese food at home! This looks so flavorful and delicious! Thank you for this dish, I can’t recommend it highly enough. Thanks so much, Glenna, for your feedback! I’m so glad you love it. I made this tonight and Oh My Word! it was so easy and way better than take out and it took me no time. My 3 yr old had 5 servings, my daughter ate until she couldn’t fit anymore food in her, and my husband was loving it. I was hoping for leftovers but no such luck, next time I’ll have to make double. Thank you so much for the recipe. Oh, I am so glad to hear that!!! Thanks for letting me know, Cat! Very good recipe but mine did not come out sticky…is there a secret? Just made this and it was lovely. Didn’t have sriracha so substituted it with Thai sweet chili sauce. Used slightly less honey to compensate for the extra sugar in the sauce and balsamic vinegar instead of white wine vinegar to add a bit more depth of flavour. Served it with green beans and steamed rice. Putting sriracha on my shopping list cos l’ll be making again for sure. That’s so great, Niki! I’m glad you loved it! Loved this last night but l’m afraid the leftovers were a victim of their own success. The author said this was delicious cold so, around lunchtime, l thought l’d give them a little nibble. End result, by the time dinnertime actually arrived l’d eaten the lot over the course of the afternoon. Can categorically say this is most definitely delicious hot or cold. Unfortunately will now have to clever up something else for dinner. HAHAHAHA. Oh Niki, you made my day. I’m so glad you loved it! I love your info. Recently retired and trying to branch out in cooking. Thank you for this recipe…on tomorrow night’s table! Congratulations on your retirement, Vanessa! I hope you love this!